The three culminating events of the International Baccalaureate Programme prepare students for taking action in today’s world. What Aaliyah Williams remembers most about her field trips to Shaker Heights High School when she was a student at Boulevard Elementary were the murals that line the school walls. “I’ve wanted to paint one ever since,” says the engaging Aaliyah, now a rising Shaker Heights High School junior. Last year, she made her own dream come true. For her Tenth Grade International Baccalaureate (IB) Personal Project, she painted a mural in the High School basement-level testing room, an otherwise ordinary, uninspired space. “I wanted to leave my mark on the school and to do something for the students who came after me,” she says. That notion of taking action to change one’s environment for the better and to make a difference in the community, and in the world, defines the three culminating events of the IB Programme: the Fourth Grade Exhibition Project, the Tenth Grade Personal Project, and the Diploma Programme Extended Essay. On the whole, the IB Programme features a global focus and emphasizes creative problem solving, hands-on projects, inquiry-based learning, and service and action. Shaker Schools received its first International Baccalaureate designation at the High School in 2010, and since then, each of the District’s eight schools has earned IB authorization. Today, the District is one of only eight PreK-12 Districts in North America to have implemented the internationally recognized IB Programme. The Programme is offered at three levels in Shaker: the Primary Years Programme for students in grades PreK-4; the Middle Years Programme for students in grades 5-10; and the Diploma Programme, an elective course of studies offered for students in grades 11 and 12. At the end of each of these Programmes students participate in one of the three research-based projects. According to the International Baccalaureate Organization, the Switzerland-based, non-profit governing body of IB, the number of IB Programmes offered worldwide has grown by nearly 40 percent since 2012. Beyond the high regard the Programme enjoys among its followers, educators, and colleges and universities around the world, the Programme’s culminating events develop relevant soft skills (like public speaking and collaborating in teams) as well as traditional skills (like research) that translate seamlessly in today’s working world. In the final two weeks in May, each of Shaker’s five elementary schools – Boulevard, Fernway, Lomond, Mercer, and Onaway – hosts its Fourth Grade IB Exhibition Night. The school halls fill with a sea of families and community members, all there to learn from fourth-grade student teams who have spent weeks researching, collaborating, and preparing their projects on a range of topics that align with the IB Primary Years Programme themes: who we are; where we are in place and time; how we express ourselves; how the world works; how we organize ourselves; and sharing the planet. The themes are broad, yet ideal for transdisciplinary learning, a cornerstone of the IB Programme. 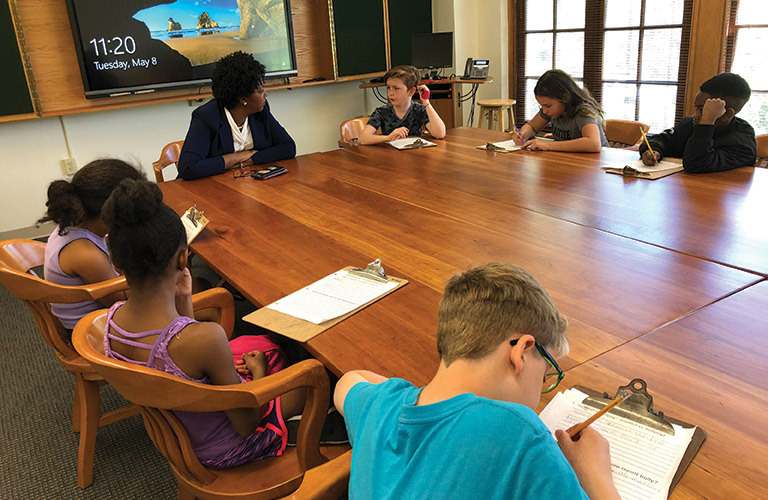 Onaway fourth-grade students interview Shaker Heights Schools Chief of Staff Dr. Marla J. Robinson for their IB Exhbition project on bullying. Each team consists of four to six students who are guided by a volunteer adult mentor, many of whom are Shaker faculty, administrators, or staff. The teams work collaboratively on their project from start to finish and meet weekly with their mentors. The ground rules for IB Exhibition projects are straightforward: Students must conduct an in-depth inquiry into real-life issues and take some action on it. This past spring, topics included habitat destruction in Cleveland, gender and racial equity, hospital patient care, and food waste, among many others. All projects include a 10-15 minute presentation, an action component, and research from a variety of sources, including a primary source who is typically an expert. This year, Fernway students took action by reaching out to organizations such as One Less Straw, a campaign created by students to reduce the use of plastics, a pervasive pollutant that threatens wildlife, particularly in oceans. The group asked the student body to take the One Less Straw pledge and curb their use of plastic straws. John Rizzo, the District’s director of Technology and Media Services, has served as both a primary source and a mentor. He says his experiences with Exhibition have been enriching personally and professionally, particularly in his role as a primary source for a group researching technology addiction. Students in the IB Middle Years Programme transition into themes with more global contexts: identities and relationships, personal and cultural identity, orientations in space and time, scientific and technical innovation, fairness and development, and globalization and sustainability. They also further refine their Approaches to learning skills – how they think, communicate, research, and self-manage. By the time they’re sophomores, they’re ready for the next IB stepping stone: the Tenth Grade Personal Project. Dr. John Moore, Shaker Heights Schools IB Coordinator and Diploma Programme Coordinator, in his office. Behind him are pictures of current and past Diploma Programme candidates. 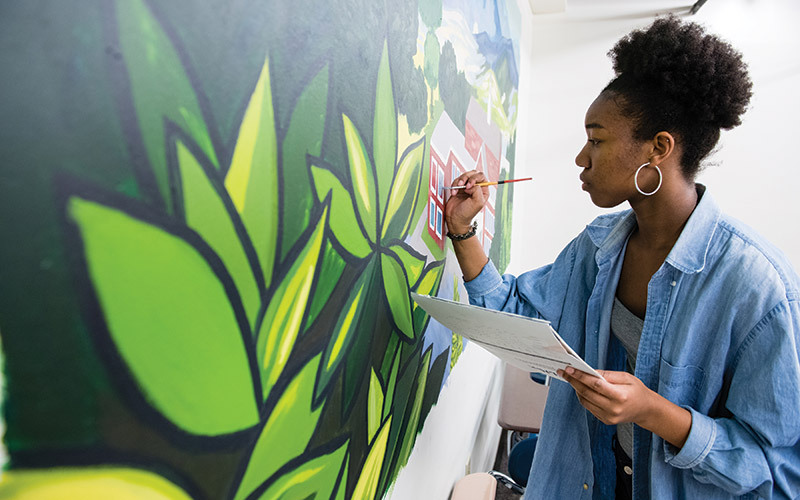 For Aaliyah Williams, the Personal Project presented her with the opportunity to fulfill a goal (painting a mural at the High School) in a meaningful way. She spent seven months on her four-by-eight-foot mural, which was inspired by a landscape painting by Harlem Renaissance painter Loïs Mailou Jones. Aaliyah admits that the project was a challenge. She was limited to working after school and required to be accompanied by an adult; plus, blending the paints to her satisfaction was no easy task. Still, she’s proud of her work, which will become her legacy. “This project helped me realize that I can take action and I can be active in my community,” she says. This coming school year, Aaliyah will enter the Diploma Programme. The High School’s Moore says that participation in the elective program has grown steadily in recent years: 54 students in Aaliyah’s Class of 2020 are enrolled as Diploma Programme candidates and participation among students of color has increased 133 percent. The core of the Diploma Programme enhances students’ abilities to analyze philosophical perspectives in the Theory of Knowledge course, which enriches critical thinking and engages them in creativity, activity, and service to develop them as leaders. Each Diploma Programme student completes an Extended Essay, a 4,000-word independent, self-directed research paper, over the course of two years. In years past, essay subjects have included: examining data and performing statistical analysis to determine the impact of income inequality on voting trends in Ohio over the three presidential elections from 2008-2016; how saxophonist John Coltrane’s utilization of less traditional playing and compositional techniques on “A Love Supreme” contrasted with his previous works and led into his more experimental projects; and the extent to which the creation of the Algerian national soccer team fostered a strong sense of national unity and led to national independence from 1954-1962. 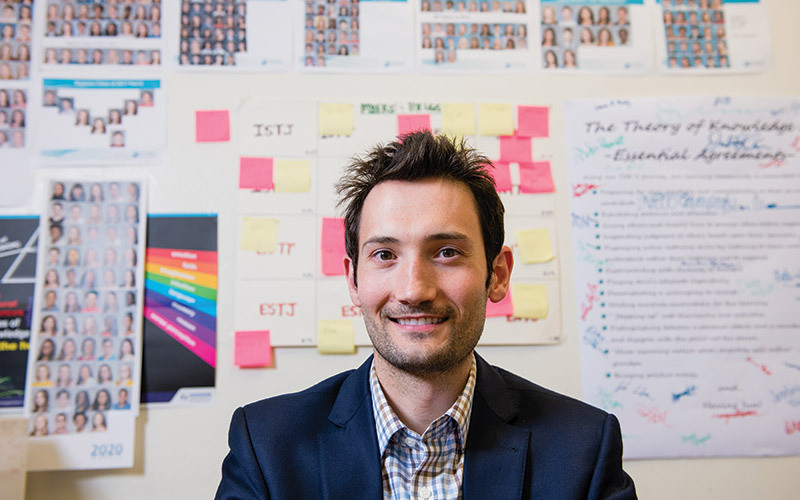 To some, the topics may sound a bit esoteric, but Moore contends the topics students select reflect how they have embraced the IB Programme and how they understand the connectedness of the world around them. Aaliyah says that she’s still considering the topic of her Extended Essay, but she has some general ideas. “I’ve been thinking a lot about what it means to be an activist and to behave and act like someone others can look up to,” she says. Her mother, Jacqueline Williams, knows that whatever topic her daughter chooses, it will be the right one for her. Originally published in Shaker Life, Summer 2018.